MetaGlycemX features a unique combination of green tea extract, cinnamon, and alpha-lipoic acid, along with a broad foundation of nutrients to be used as part of a healthy diet for maintaining healthy blood sugar levels in those who have concerns. Green tea contains epigallocatechin gallate (EGCG), which has been shown to protect pancreatic islet cells and supports healthy insulin action. Cinnamon is becoming increasingly well-known for supporting healthy insulin activity. Alpha-lipoic acid is a potent antioxidant that acts as a free radical scavenger and additionally has been shown to support glucose transport to cells. 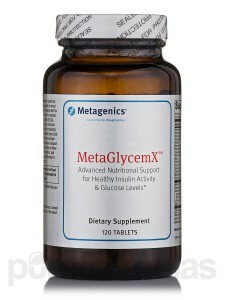 MetaGlycemX also features enhanced levels of other key supportive nutrients—including methylcobalamin, biotin, chromium, and vitamins C and E—combined in a well-rounded formula for individuals with blood sugar concerns. Enjoy MetaGlycemX at a 10% discount during the month of December!